Day of Peasant Struggle - Climate Justice Now!Climate Justice Now! Cochabamba, April 17 2010: Peasants, women and men from farmers organisations throughout the world, members of La Via Campesina, celebrate the 17th of April as the International Day of Peasant Struggle, and reaffirm their vow to intensify the mobilization for the rights of peasants everywhere. To commemorate this date, delegates representing distinct countries, beginning at 11am, in the Plaza 14th of September, in Cochabamba, Bolivia, with the proposal that this date not be forgotten, and so that the struggle of peasants becomes stronger. 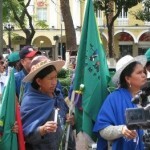 With delegates from throughout the world, the women and the men of La Via Campesina Bolivia commemorate the anniversary of the massacre of 19 peasants that fell struggling for access to land, in the state of Pará, Brazil in 1996. On April 17 1997, after three months of protest for the defense of Mother Earth and for the cultivation of the coca leaf in Bolivia, seven indigenous peasants, including a child and its mother, were massacred. In Cochabamba, thousands of peasants from throughout the world are gathering at the beginning of the week to participate in the Peoples’ Conference on Climate Change and the Rights of Mother Earth, invited by President Evo Morales. More than 300 members of La Via Campesina fom around the world will be participating. According to the organizers of the conference, more than 7,500 people have already registered for the conference. Additionally, about 3,000 peasants from La Via Campesina Bolivia are leaving their communities in order to defend peasant agriculture and climate justice. This entry was posted in Cochabamba and tagged Cochabamba, Via Campesina by admin. Bookmark the permalink.